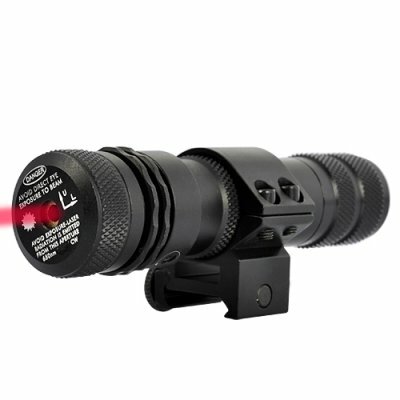 Successfully Added Long Range Tactical Red Laser Gun Sight for Rifles (Weaver Rail Mount, Dual Switch) to your Shopping Cart. Tactical Red Laser Gun Sight (Weaver Rail Mount): Policemen, soldiers, and hunters: the perfect rifle accuracy accessory is here and ready to help you make that shot. This situation, common in many video games, can now become real with this convenient Tactical Red Laser Sight! Made of rugged aluminum and painted in glossy black color, this gun sight has been designed to be resistant, durable and fit most weapons with a weaver rail mount (such as shotguns and rifles). Just fix the device right under the barrel and the red laser will guide your bullets to its target. This beautiful precision gadget also comes with two Allen wrenches to adjust with meticulous care the laser beam.